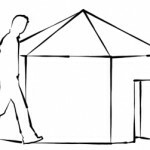 So, You’re Ready To Build Your Hexayurt ……………. You’ve got your Burning Man tickets. The hexayurt panels are in the garage and the UPS man just delivered your bi-filament tape. You’ve got sketches and plans, friends are coming over and a six pack is chillin’ in the refrigerator. Now, take a deep breath, sit down in a comfortable chair and watch this video. It’s not the newest hexayurt construction video, but it is the best. It features Vinay Gupta, the inventor of the hexayurt and it is the best way to get a real insight into what hexayurt building is all about. Now you’re ready to build.